Are you looking for baby shower foods to wow your guests? 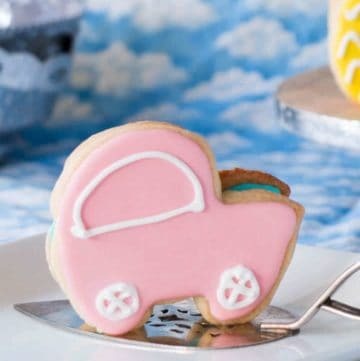 Try building these creative baby shower cookies disguised as baby carriages. Curious about how these baby shower cookies are able to stand up? Watch my recipe video and read my expert tips below to find out the yummy secret ingredient. Plus, I’m using Betty Crocker Sugar Cookie Mix, so you can make these easy sugar cookies at home. Forewarning, the hardest part of this recipe is waiting for the sugar cookie icing to dry at room temperature after each decorating step. Looking for baby shower foods to wow your guests? 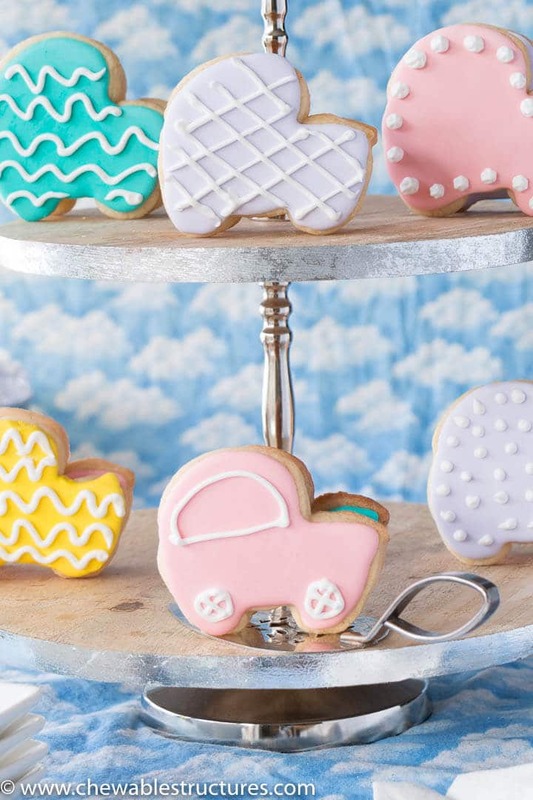 These edible 3-D baby shower cookies shaped like baby carriages will be the centrepiece of your dessert table. WATCH MY RECIPE VIDEO BELOW to see how to build these fun baby shower cookies. When it comes to cookies, parchment paper is your best friend. Using parchment paper allows your cookies to form a light golden crust on the bottom of the cookie without burning it. Plus, the parchment paper prevents the cookie from sticking to the baking sheet. Let the sugar cookies cool in the baking sheet when you remove it from the oven. If you skip this step, your baby shower cookies won’t hold their shape and will crumble when remove them from the baking sheet. I know this from personal experience. Like others, I can’t resist freshly baked warm cookies and I ended up with a delicious crumbly mess. After the cookies cool, they should be firm on the outside and chewy in the middle. 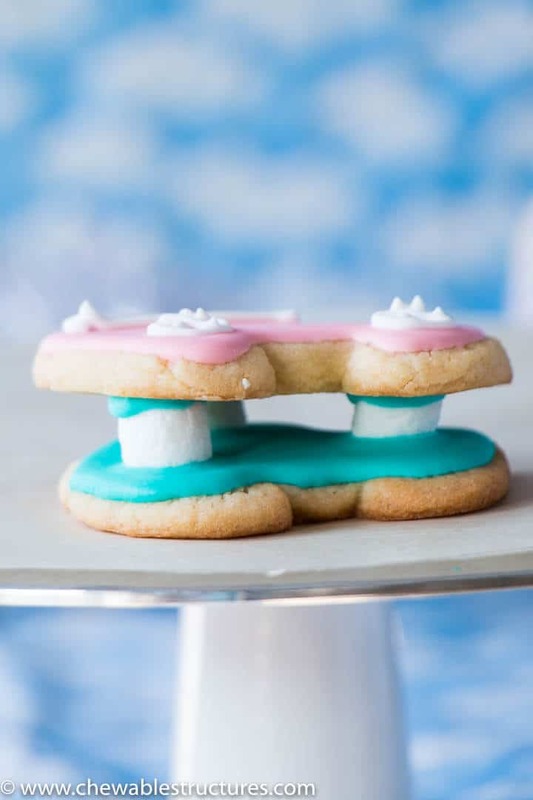 The secret ingredient that helps these baby shower cookies standup is marshmallows. Placing three small marshmallows between the front and back sides of the cookies provides enough support for the cookies to prop up while offering a bit of flex to lean if needed. My recipe for sugar cookie icing with 3 ingredients helps bind the marshmallows to the sugar cookie. To make the sugar cookie icing, you just need Wilton Meringue Powder, water and icing sugar. Check out my sugar cookie icing recipe for a guide on how to make 10-second royal icing for decorating and 4-second royal icing for flooding the cookies. 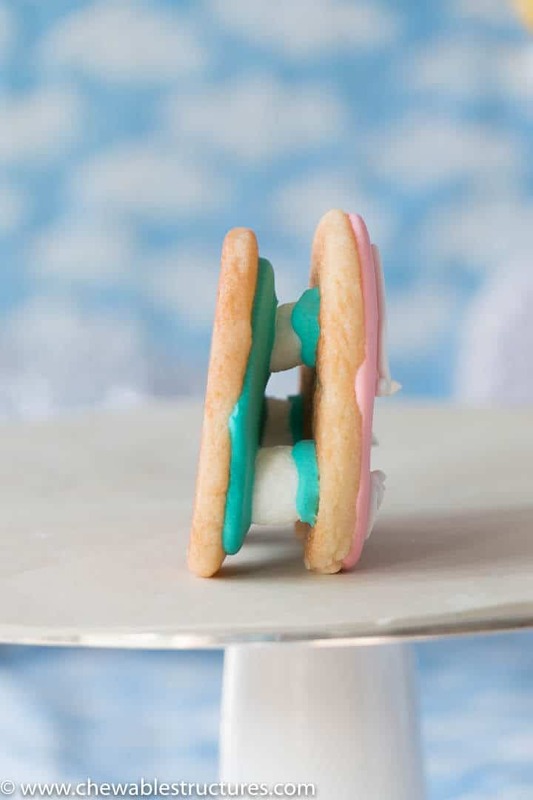 Small marshmallows provide support so these baby shower cookies are strong enough to stand vertically. Here’s the cookie cutter I’m using to make these adorable baby shower cookies. 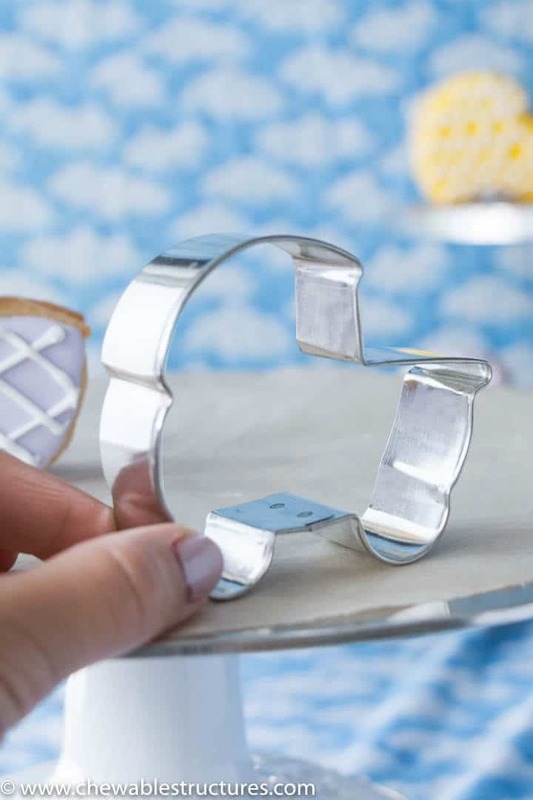 Check out this adorable cookie cutter shaped like a baby carriage. Your cut out sugar cookies will speed away. Vroom vroom! Are you making baby shower foods to wow your guests? If so, tell me about it in the comments below. I’d love to see what you’re building at home. In a large bowl, add the sugar cookie mix, flour, melted butter and egg. Using an electric hand mixer or wooden spoon, stir together the dry and wet ingredients just until combined. (Do not over mix the cookie dough otherwise the cookies will be hard). Add flour to your work surface and a rolling pin. Roll out the cookie dough until ½-inch thick. Cut the cookie dough using the baby carriage cookie cutter. Using a spatula, transfer the baby carriage shaped cookie dough to the baking sheet at least 1 inch apart. Gather the scrap pieces, reroll and cut with the cookie cutters again. There should be 16 cookies. Using the 4-second sugar cooking icing, flood 8 cookies (front carriage). Set aside. Using the 4-second sugar cookie icing, flood the remaining 8 cookies (back carriage). While the icing is still wet, add three marshmallows so that the flat side bonds with the icing. Add more icing on top of the marshmallow, then place the first 8 cookies (front carriage) cookie on top. Transfer the 10-second icing to a piping bag with Wilton #2 tip. Decorate the front of the carriage cookie. Let dry for another 6 hours at room temperature. Transfer the baby shower cookies to a serving tray. 1. The 10-second sugar cookie icing (for decorating) recipe yields 2 cups of icing. Of this, I save ½ cup for decorating, then I add water to the remaining 1.5 cups to make 4-second icing (for flooding). See my sugar cookie icing recipe for full details. 2. When you flood the cookies, you need to work fast because the icing starts to crust over.